Based in The United States, Smooth Viking beard care offers a range of 100% natural products to keep your beard looking good. I have been using the Smooth Viking Beard Balm for the past few days, a balm made from Mango Butter, Shea Butter, Beeswax, Avocado Oil, Sweet Almond Oil, Argan Oil, Castor Oil, and Pure Essential Oil. It has a slight scent and Smooth Viking don’t let on as to what it is, I can’t quite get the scent but it could be Eucalyptus or Tea Tree, but then I could be wrong. The Scent is so slight that it’s really an unscented balm and helped to make my beard feel a bit softer. 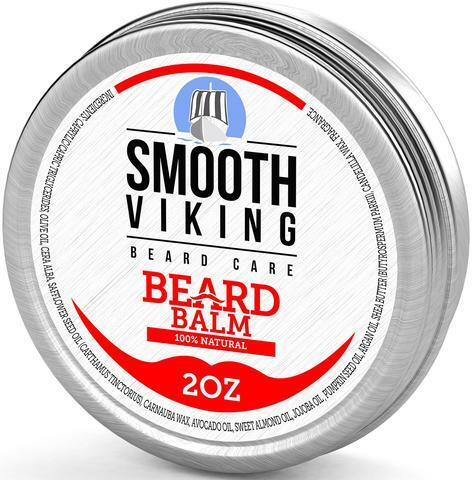 Smooth Viking Beard Balm comes in a 2oz tin with a screw lid, available from the Smooth Viking website and Amazon USA and there are plans to sell in the UK soon. The 2oz tin costs $14.95 or £12.97 from Amazon UK by clicking the buy button at top of the review. You can also keep up to date with Smooth Viking on Facebook and Instagram. Smooth Viking was founded in 2014 with an inspiration to create a collection of products that change the way you take care of your beard. Current beard care items on the market frankly don’t cut it to our standards – they are full of artificial ingredients that don’t provide the necessary strength and quality for proper maintenance. Our products feature a blend of wholesome 100% natural ingredients that provide ultimate nourishment. With each application, your beard will grow stronger and healthier so you can look your very best. And that is not a sailor’s promise; it’s a genuine one. I know it may be hard to believe, but no, we are not in fact actual Vikings. We are simply inspired by them. Our products are designed for the modern man; however our values stem from the following qualities found in these famous 10th century warriors. Say what? Yes, you heard right. When people imagine a Viking, they typically picture an unkempt, filthy, brutish figure. However quite the opposite is true. Vikings were considered very clean and regularly bathed once a week (unheard of at that time). Combs, tweezers, razors and other grooming utensils have even been found by archeologists, which indicate that the Vikings were rather adept at keeping up appearances and maintaining proper hygiene, even during their unruly adventures. You don’t become renowned seafaring soldiers by being average. Vikings started out as regular farmers, craftsman and tradesman that became warriors bonded by their shared mission to explore the world. They traveled far and wide on longboats, reaching the lands of North Africa, Russia, the Middle East, and North America. Our collection of beard care items was created in mind to emulate the strength of these soldiers. Our formulas are packed with robust ingredients to deliver intense nourishment, so that your beard can fare all types of weather. With Smooth Viking, your beard will always be in tip-top shape so you can conquer the day ahead. It doesn’t take just brute force to dominate the world. You need cunning and ingenuity as well. One of the reasons the Vikings were successful with exploring the depths of the Earth was because of their smarts. In particular, Vikings were feared for their longships that were especially designed to navigate oceans as well as traverse through shallow waters, allowing them to land directly onto beaches. We harnessed the ingenuity of the Vikings to create our own line of products that contain premium ingredients so that we can be leaders of the pack. Made with all natural ingredients, our beard care items are superior in quality to other competitors that use fillers or artificial ingredients.